During a visit to the States hubby and I were lucky enough to include a few days exploring Tombstone, Arizona. I had always had a fascination for “cowboys and Indians” and grew up watching classic cowboy shows (reruns of course!) such as Gunsmoke, Bonanza and The Lone Ranger, so a visit through the cactus riddled Arizona Desert and the red hills of Sedona to Tombstone was high on my “Must Do” list. Of course once in Tombstone the Boothill Graveyard was one of the first places I wanted to see. This cemetery is the final resting place of Frank and Tom McLaury and Billy Clanton (the three men who were killed during the infamous Gunfight at the OK Corral) as well as many other colourful characters from the old west. It was a really interesting place to visit. The ground is just dirt, rocks and bushes and cactus seems to grow wild. 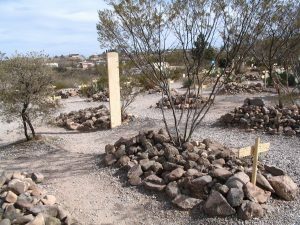 The graves are marked with wooden crosses and markers and rocks are piled onto each grave “to keep the varmints from digging the bones up”. It feels like “the wild west” and reading the epitaphs of the interred stirred up images of how life would have been in the “Wild West”. 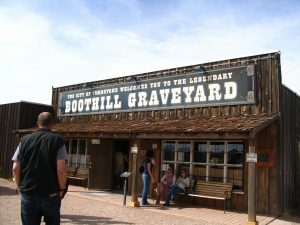 The Boothill Graveyard was originally the Tombstone Cemetery and was established in 1879. In 1884 another cemetery was created and this original cemetery became known as Old Cemetery. 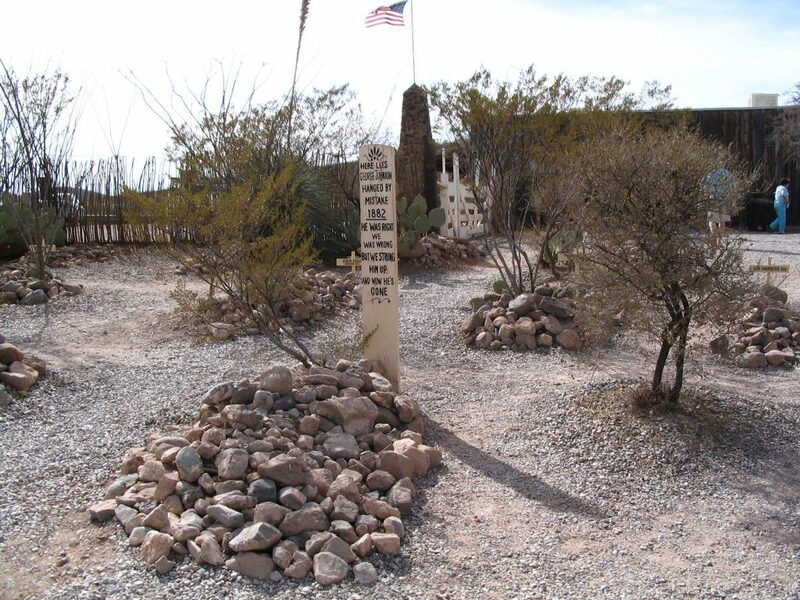 The townsfolk of Tombstone preferred that their loved ones be buried at the New Cemetery so there were few burials at the Old Cemetery after 1884 and in fact some even had bodies moved from the Old Cemetery to the New so that their relatives were no longer buried beside the robbers and murderers of the old West. Over time, as the population of Tombstone dwindled due to the silver boom ending people left town to live elsewhere and the Old Cemetery became abandoned and neglected. It was overgrown and littered with debris, cattle and time had trampled the graves and nature had disintegrated most crosses marking the graves. When, in 1929, a former mayor of Tombstone returned to the town after living out of state for several years he was distraught to find that he was no longer able to locate the grave of his wife and as this was the catalyst for the remaining townsfolk to clean up the Old Cemetery. They enlisted the help of the Boy Scouts to remove the debris and long-time residents were asked to recall where the individual graves had been. Some were easily located by memory if the deceased person was well known or a notorious criminal, others however, were more difficult to locate, especially if the family of the person had left town to live elsewhere (as was common after the boom days of Tomebstone.) The Old Cemetery was restored, tidied up and new grave markers placed on the graves. It was then that it was renamed Boothill Graveyard as a reference to the history of the Wild West where many people died quickly and often with their boots on. 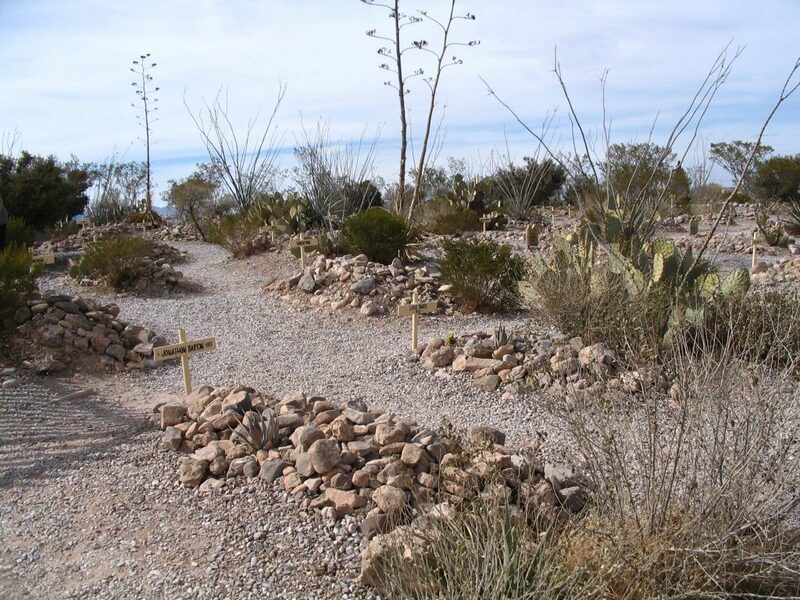 These people would then be buried with their boots on and as a result it was commonplace for many town in the wild west to have their own Boothill Cemetery. http://www.boothillgraves.com .